Two Americas exist - one of imagined wealth, propped up by speculation and endless booms-and-busts, and the other in systematically defunded, segregated communities, where “the American dream” feels hopelessly out of reach. Owned: A Tale of Two Americas (2018) recounts the stories of Americans running towards a dream created by post-war policies. unbridled commoditization, and racist motivations. 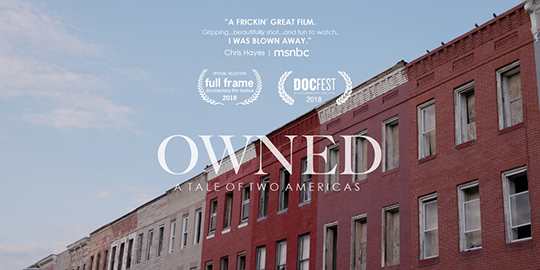 Delving into the history of the housing policies put into place after World War II and the personal struggles for home ownership, 'Owned' brings to light the hidden, and not so hidden, events that define the American Dream. Enjoy a panel discussion with special guest: Giorgio Angelini (Director). Dr. Assata Richards (Director, Sankofa Research Institute), Steve Radom (Principal, Radom Capital) and Raj Mankand (Editor, Cite Magazine).